BigBet wrote: waitaminnit... I thought that Ireul's appearance in NERV was NOT foretold in the DSS, and that's why SEELE questions Gendo 'bout ver. Am I wrong? According to the dialogue in Ep14 (~10:49min), Iruel specifically wasn't foretold (were any of the Apostles actually 'named' in the SDSS?) but "an invasion by an Angel" was, except Iruel came 'too early'. She also wasn't supposed to be allowed to enter Dogma, either. Like Jabberwok said, I think Gendo was just trying to stay on Seele's good side for the time being. 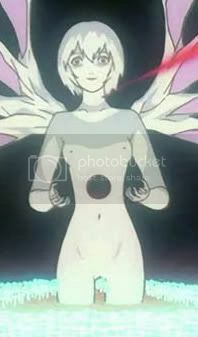 He doesn't deny the Angel's existence, but he says very clearly that the 'Eleventh Angel' did not invade Nerv, and that the reports were wrong. Maybe Gendo just counted Israfel wrong. Who knows. Ornette wrote: ahh yeah, those wings of energy or whatever they are, definitely happen before HQ report anything about AATFs. IIRC Adam's wings were also yellow and translucent, so not sure about the 1 to 1 relationship. According to DEATH at least, everyone's wings are different. Yui's are yellow and translucent, Adam's are bright yellow, almost glowing white, and Lilith's wings seems to be actually made from the same material as her body. Jabberwok wrote: This seems to be a good thread to properly end my long, unregistered lurker status. And it might even be marginaly contructive and/or intelligent. Excellent! May you set a good example for those dozens of unnamed others! 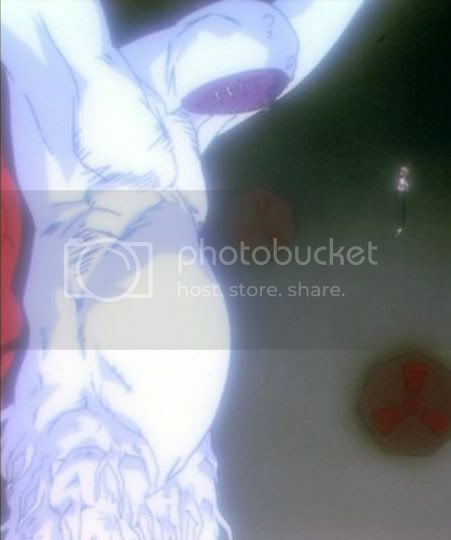 Something I didn't think up til now, and prolly holds about as much water as a sieve, but could the souls streaming into the Guf maybe be souls reserved for Yui and the whole "ark to save mankind from the vacuum of Third Impact" thing, whereas the souls in the moon are specifically for Intrumentallity/Complementation? I wouldn't call it a sieve at all. Reichu is impressed -- you just went straight into "Fork in the Path" territory! I won an Internet on "THAT BOARD", but, here. Now you can have it. Congratulations! A brief abstract of the theory: The path of human souls that are carried to Shekinah takes two directions once it reaches her hands: Some are channeled (along a helical path) into the top of the Black Moon, while others head into the Doors of Guf on her palms. This represents a 'fork' in the Path to Divinity -- that is, souls can chose between the two scenarios for human evolution, which were presented towards the beginning of EoE. The Black Moon is the site for Seele's scenario, whereas those interested in the YKG Plan get channeled into the Tree of Life to fill up Yui's Chamber of Guf (evolution via rebirth happens later). That's about the simplest I can put it. Reichu can elaborate further on demand. Discuss, if you feel like it. Make a new thread if it seems like a good idea. Whatever. Oh and one more thing: Did Anno intend for us to ask these questions in the first place? Reichu wrote: A brief abstract of the theory: The path of human souls that are carried to Shekinah takes two directions once it reaches her hands: Some are channeled (along a helical path) into the top of the Black Moon, while others head into the Doors of Guf on her palms. This represents a 'fork' in the Path to Divinity -- that is, souls can chose between the two scenarios for human evolution, which were presented towards the beginning of EoE. Didn't you talk about this a while ago - or was it someone else? How the blood spewing forth from GGNR's neck (after the jugular thing) are actually the souls that do not want to return to human form...or something like that??? Reichu wrote: The Black Moon is the site for Seele's scenario, whereas those interested in the YKG Plan get to fill up Yui's Chamber of Guf (evolution via rebirth happens later). Does it actually say somewhere that by going into GGNR's palm 'slits', are the souls going directly into Yui??? I guess if this was true, then the "Lilith = useless after gathering" theory is also true. Stop frontin', your only preoccuprations are ignoring Camille and praying to god he never finds his way to the East Coast. Just a tiny reply before I pretend to actually do my job and maybe get paid for it. I belittled my theory as such because halfway through forming it, I seemed to recall the soul stream splitting (don't cross the streams!) occuring before Shinji makes his final decision. I think it's even before he... ah... de-couples from Rei. Hmm. Unless Rei/Lilith/Yui(?) gave humanity the choice well before Shinji even realized he had a choice to make, and implying that they knew the effort would not be wasted and that Shinji would make the right decision after he got to chat with mom for a while? I'd love to watch the specific scenes right now, but there is only so much I can smuggle into work. I shall return. CanonRAP wrote: Didn't you talk about this a while ago - or was it someone else? How the blood spewing forth from GGNR's neck (after the jugular thing) are actually the souls that do not want to return to human form...or something like that??? Wasn't that the harpie's(s') ? Magami No ER wrote: Wasn't that the harpie's(s') ? Reichu wrote: I've made references to FIP before, but the thing about Lilith's neck didn't come from me. There were also a few more, but it says the same thing and there wasn't any discussion about it. (1) #24: In the final scene, with Shinji and Misato at the beach, Shinji says that "Kaworu-kun was like me". What does he mean by this? I don't think they were similar, I think Shinji was just a bit loopy/angsty t33n. (2) #26': Why does Gendo stick his hand into Rei's left breast and immediately move it down towards her navel? If this hasn't been said before, isn't her heart there. And since she is like Kaworu/Lilith/Adam, perhaps that is her core. Also her navel is the womb, and since she represents "Mother" and Gendou has Adam in his hand, it would make sense that Adam and Lilith merged in the womb. (3) #21: During the Antarctic Investigation scene, we see that Misato is being "quarantined" on Investigation Ship No. 2. Why is she being kept on this ship? What's the deal with the conditions she's being kept under? Was the compartment her father put her in found by that ship? They were probably investigating her since she was the sole survivar of second impact, or they were preventing her from commiting suicide. Ornette is officially the Search Guy now. My brain is totally empty with regards to Lilith's neck ripping open, the spout of blood hitting the Moon, and a ring of blood forming around the Earth. I asked Mr. Tines once about what would theoretically happen to that ring, and he said, "The ring is in low orbit, so [it] would dissipate in years at most." So by "dissipating", where exactly does it go? On a similar note, there isn't any particular clarity in my mind on the crosses of light, except the observation that we have another Cross of Light / Wings of Light parallel in place: In EoE, the former launch souls into the air, not unlike Adam's "huge f***ing wings" in DEATH. Brings to mind comparisons I've heard in the past comparing the Lilim's crosses to that of Sachiel -- see the how the pieces fit together? -- but I lack the brain-energy to find the specific citation. Might be in one of these. ...I suspect it has to do with FIP. I'll at least point out right now that neither this detail, nor the souls flowing into the Doors of Guf, were present at the storyboard stage. The latter wasn't even there at the layout stage (intermediary between the econte/storyboard and genga / keyframe animation). Both were apparently late arrivals in the conceptual game and may have been added for the same narrative reason. That would make sense -- souls go into Lilith, and then, later on, a significantly smaller amount pops out of her. Miduki wrote: (1) #24: In the final scene, with Shinji and Misato at the beach, Shinji says that "Kaworu-kun was like me". What does he mean by this? Episode 25 wrote: Shinji: There was no other choice! Shinji may have, unconciously, stumbled across what Misato found out about humans being the eighteenth angel. Wrote a reply to BigBet, then realized that it was the sort of thing I'd planned to eventually put in that ol' Kaworu thread of mine (I think...). Hence, moved here. Yay! Miduki wrote: If this hasn't been said before, isn't her heart there. And since she is like Kaworu/Lilith/Adam, perhaps that is her core. Also her navel is the womb, and since she represents "Mother" and Gendou has Adam in his hand, it would make sense that Adam and Lilith merged in the womb. No. Bad! Read whole thread! Ah, the navel is still related to birth, it connects child to mother. Miduki wrote: Ah, the navel is still related to birth, it connects child to mother. Yes -- I specifically mentioned the umbilical cord symbolism in the post I just linked to. I also forwarded a suggestion regarding what they're really getting at here. Reichu wrote: So by "dissipating", where exactly does it go? I think Mr. Tines meant that the blood's orbit, as low as it was, would disintegrate rather quickly, the blood itself dispersing through the upper atmosphere (oh good, now its raining blood). Assuming you're refering to the cloud of souls from Rei's neck, I've got nothing serious to add. Considering the hundreds of millions of souls that chose Rei over the Black Moon, I don't know why only two dozen or so popped out... The only thing I could think of (and I said it wasn't that serious) is that if the Black Moon asploding signifies the end of Intrumentality, then maybe the souls from the neck are the few individuals, the only individuals, that actually wanted Intrumentality in the first place(i.e. the council of SEELE) and now have no where left to "be as one". Maybe? I do like the thought of Keel groaning "Shinji divided by infinite zero. Oh shi-" as the Moon bursts, though. I did, and while the "Fork of Divinity" theory doesn't seem any weaker, I just feel like I'm missing something to really bring it together (not like NGE would let that happen, but one can dream). I think I may take up the suggestion of starting a tread on the topic, though. Maybe after I learn how to imbed small SS and catch up on reading old threads (just to make sure I'm not rehashing old, erroneous trains of thought). Ornette, the Search Guy wrote: Some good threads about 2I, among other things. These were fun to read and I wish I had done so sooner. I'm not going to touch the Anti-Anti-AT-Field (AAATF, hell yes!) properties of the escape pods/plugs and the topic seemed pretty thoroughly discussed, but I can think of one thing. In end of Misato's flashback at the beginning of Ep:12, the look on her face as she stands in the pod. She looks saddened and maybe a little surprised; it transitions well with the face of the older, angrier Misato in the following scene. But it doesn't seem, to me anyways, to transtion as well with the traumatized, mute Misato from Fuyutsuki's flashback in Ep:21. That was until I read someone's comment about ghostly Kaworus tangifying everybody. I suddenly imagined a badly wounded Misato being approached by Kaworu, who then morphs into the person she most wants to be loved/accepted by, her father (at least according to her Complementation from Ep:25(? ), correct me if I'm wrong here). 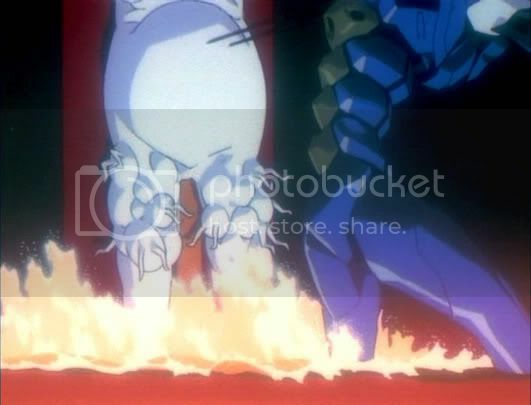 Misato's pod continues to drift away from ground zero, Adam is in her death thoes, her AATF weakening, a father reaches out a hand for his child, but then dissipates forever. ...Okay, two things, though this one is worse so I'll make it shorter. I thought of this when I was trying to figure out just why the hell she was even in Antarctica. This drifts violently into "old, erroneous trains of thought" territory, but whatever. One more final: What does FIP stand for? No biggy, I didn't see it in the Geektionary at FGC, is all. I'll try coming up with some other stuff later. Peace. Due to overload (a frequent phenomenon -- brain producing more output than it's possible to release in a given timeframe), I need to respond selectively again. Jabberwok wrote: I think I may take up the suggestion of starting a tread on the topic, though. Maybe after I learn how to imbed small SS and catch up on reading old threads (just to make sure I'm not rehashing old, erroneous trains of thought). FIP is just "Fork in the Path (to Divinity)". "Path to Divinity" is alternate way of translating kami e no michi (aka "Path to God(hood)"), and I believe in NGE it's literally referring to the Sephirotic Tree of Life as a symbolic representation of the path humanity must walk to Ascend (whatever exactly said path entails), apparently something only Adam (or someone with equivalent power) can open. Blah blah metaphors pedantry esoteric mumbo jumbo. ;) The name of the theory is a reference to both the kami e no michi and the visuals that inspired this particular line of inquiry in the first place (the literal path of souls that goes two separate ways). What do you need to know about imbedding screenshots? Feel free to start a "Fork in the Path" thread, since I think it's something that's needed serious consideration for a good long while. I have enough things to do that I can't execute the laborious and perfect presentation of my dreams, but the questions posed here so far provide a fine launch pad for introducing some of the concepts. The sentiment "I just feel like I'm missing something to really bring it together" is rather valid as 'in-forum exposition' currently stands. Okay, and now for an afterthought @Mizuki. Alright alright. Anatomical stinginess about navels and uteri aside, the general abdominal region is associated with pregnancy, for the obvious reasons. I suppose this is a chance to quickly vomit up what might be another level of connections. For some reason, after the Spear is pulled out and Lilith regenerates her legs, she gets this swollen gut. In this shot from #24' -- wherein the artist has opted to give her a level of physical definition not really seen elsewhere in the show, also apparent when we see her back and shoulders in another cut -- she looks distinctly... well... "preggers". It's still there in EoE (but Lilith is back to more typical blobby-ness). I find this whole "pregnancy" thing to be awfully mysterious. But -- keeping the whole "Gendo sticking embryonic Adam into Rei 3's abdomen" bit in mind -- there might at least be some kind of "visual payoff" for this shortly afterwards. I think FIP="Fork In the Path"
The 2 paths makes sense, Ritsuko mentioned that the "Room of Gauf was empty" in ep23, exactly what that means, I'm not sure. But Fuyutsuki said "The Chamber of Guf (Hall of Souls) has been unsealed", GNR's hands. So are these souls filling the chamber of Guf? Meaning that these are the souls that will used for newly born people?